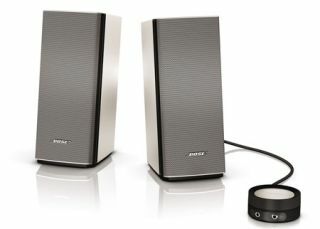 Bose introduces Companion 20 computer speakers with DSP for £199 | What Hi-Fi? Need a smart looking pair of stereo speakers to go with your computer? Say hello to the new Bose Companion 20, yours for £199. Each speaker measures 8.9cm wide x 11cm deep, incoprates a new driver and amplification and uses Bose TrueSpace digital signal processing (DSP) to "expand the acoustic image". Volume control is via a circular control pod that also gives one-touch muting, and there's a headphone jack and input for connecting other portable devices. The Bose Companion 20 is available in silver from Bose retailers and the Bose website.